This entry was posted on Friday, June 18th, 2010 at 8:45 am and is filed under U.S. Navy, Vietnam. You can follow any responses to this entry through the RSS 2.0 feed. You can leave a response, or trackback from your own site. Escape From Laos is not about Klussmann, it was written by Lt. Dieter Dengler, who spent almost six months in Laos in the spring and early summer of 1966 then escaped from a POW camp and was ultimately rescued. 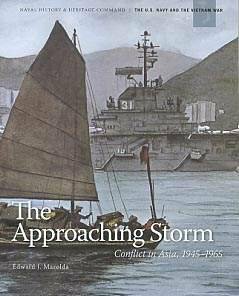 “Escape From Laos” is the title of the sidebar on page 58 of The Approaching Storm, which deals with the Klussmann escape, as well as Lt. Dengler’s book. This could be a good read but it would be better if both sides were well researched and not based on assumptions or hearsay. Vietnam is forever merged with the US in a history of blood and war but the progress of Vietnam today is shouldered by it’s desire to place the sadness and turmoil of the war behind her. C’est vraiment très “courageux” de la part des USA de bien vouloir décrire et parler de “la Navy et Indochine”. Je constate une fois de plus que les “Américains” ne cachent rien des évènements concernant les guerres menées, et c’est tout à leur honneur. Merci de nous instruire de cette sorte. Carrier Air Wing Six flying from USS America, we bomb dirt because we had a no win at any cost strategy. Policy makers in the 1960s should never sleep. Rectifico donde dice SIN tiene que decir UN gracias y perdon. I’m glad to see you promoting these military histories. Of the few dozen DoD histories I’ve read of various periods from WWII through the invasion of Iraq, I’ve found them to be mostly even handed. I think this stems from a “lessons-learned” mentality that understands that you can’t do better next time if you’re not honest about what went on before. And naturally I’m very happy to see you consistently providing library links along with other ways of getting this book. Thanks for the work that you do!